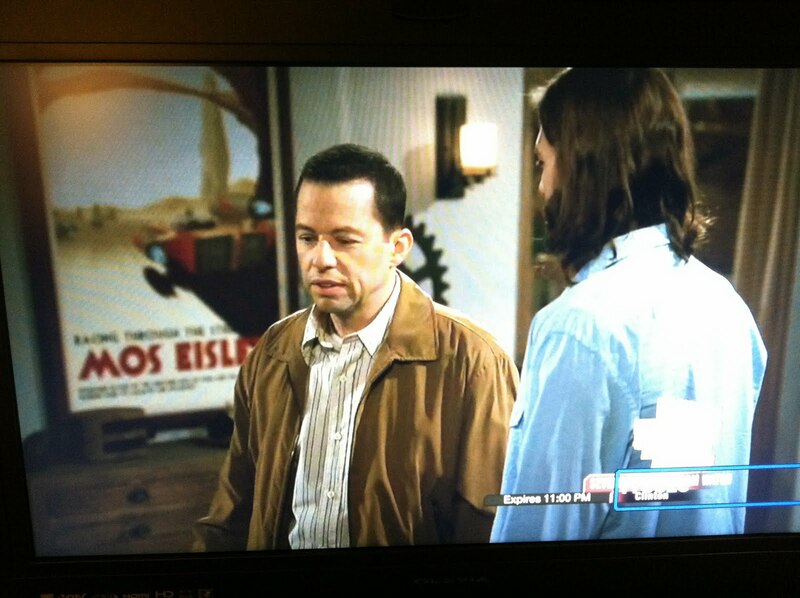 Steve Thomas [Illustration]: My Star Wars/Mos Eisley vintage racing poster was on Two and a Half Men tonight! 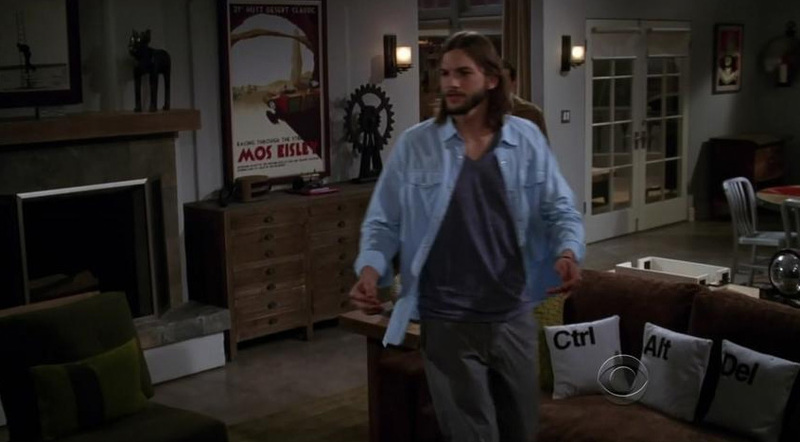 My Star Wars/Mos Eisley vintage racing poster was on Two and a Half Men tonight! Print available on Ebay until Nov. 24. Saw it on the show. All your star wars prints are sold out. Any reprints soon? AWESOME :D want to order one too! Why is that version way bigger then the copy I have on my wall? It's huge! Unfortunately they are sold out through AcmeArchivesDirect and this particular one they used on the show was a special oversized print. I have a few artist proofs of which I've put one on ebay for now. The link is in the blog post. Thanks! I want to buy this poster! I want those Ctrl Alt Del cushions!! Amazing pictures! 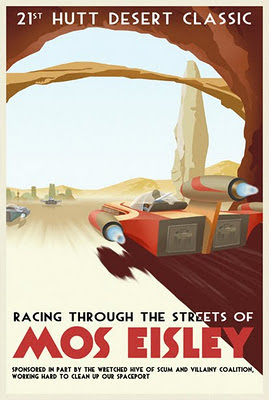 Mos Eisley rocks, If you sell them I would gladly pick one up. Do you have plans to run this in a poster in the near future? Saw this on two and a half men again, love it and want one, please run another set of prints so i can put one in my man cave!!!! Is this poster available at all? We just saw it on the show this week. Thanks! Husband is really wanting one of these for his man cave as well. Any plans to make it more widely available with the publicity from Two and a Half Men? Guess your so proud because your poster was featured on the show. I know many will be interested on your artworks from now on, saw it on the show also. Good work! can i get on any where? I would definitely be onboard for a large format print, should they be made available... didn't realize the one featured on '2&1/2 men' was a one-off. The thirties meet the future! I saw it on 21/2 and googled. Nice work. Geo Ham would be proud. That thing keeps showing up on 2.5men. Any plans to reprint it? Kept seeing it and thinking I'd like one. Googled it and ended up here didn't realise it was so unique. Come on already, give us way we want! I saw the Mos Eisley poster on 2 1/2 men and said to my wife, "I want that poster!" I viewed you portfolio and said to myself "I want ALL of the Star Wars posters and the Tron poster!" I do hope that you make them available for retail soon. You artwork is epic! I want one too! . Awesome poster! I would really like to see a large size reprint. Buy the poster, and like any sports card take it to a printing shop have them resize it! Dang, I watch this show every week and am so embarassed to admit I just noticed it tonight. Wicked cool print!! PLEASEEEE oversize them and run another batch - they are AWSOME!!!! is there any news about some reprints of your work? When will you have more in stock? Really want to buy one! How do I own one ?